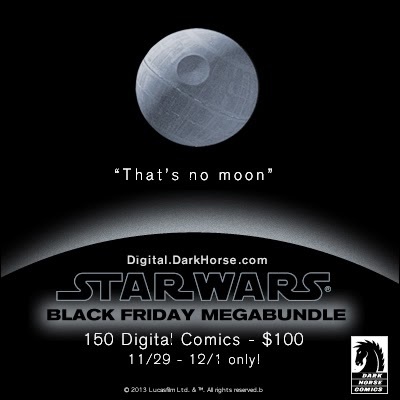 Howlin' Wolf Records: SIX STRINGS: Dark Horse Digital: STAR WARS BLACK FRIDAY! Feast your optic sensors on this year’s Black Friday MegaBundle. For one weekend only, you can get over 150 digital Star Wars comics for the crazy-low price of only $100. Get classics like The Clone Wars, The Old Republic, and all three arcs of Crimson Empire. Get a taste of Brian Wood’s critically acclaimed Star Wars series. Your favorite Sith friends are here too, with Darth Maul and Darth Vader series, plus the latest series, Lost Tribe of the Sith. Your favorite bounty hunter, Boba Fett, is here, plus the Imperial spy comic Agent of the Empire. Go back in time to the origins of the Jedi in Dawn of the Jedi, travel to hundreds of years after the films end with Legacy, and more! Over 3,500 pages of Star Wars goodness! This sale goes live at midnight (PST), Friday, November 29, and runs through midnight, Sunday, December 1. Get this MegaBundle here: EWOKS ARE WELCOME!, before Chewie punches it, and it jumps to hyperspace! That's an amazing deal Jeremy! Less than one dollar a comic!